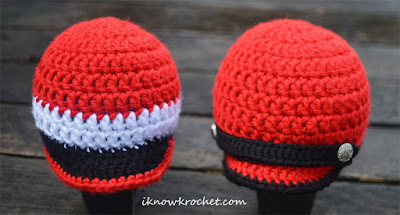 What is the perfect, fast and easy crochet gift for both adults and kids? 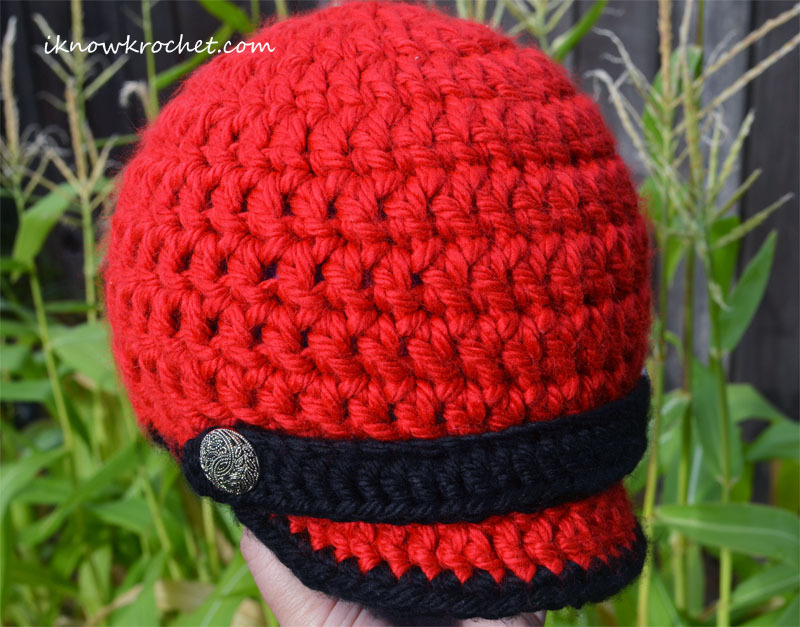 It's a super bulky crochet newsboy hat, suitable for all genders. 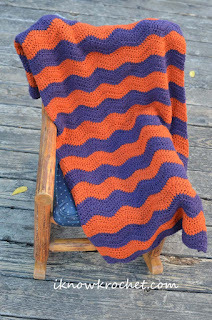 It can be made in any color, and is especially fun to make using a person's favorite team colors. I have some friends who are big Utah Utes fans, so I made them these hats in red, black, and white. 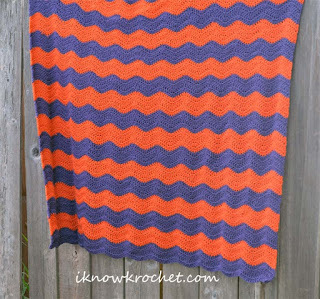 This is a great pattern that is very easy to follow and is offered in several sizes from toddler to adult. 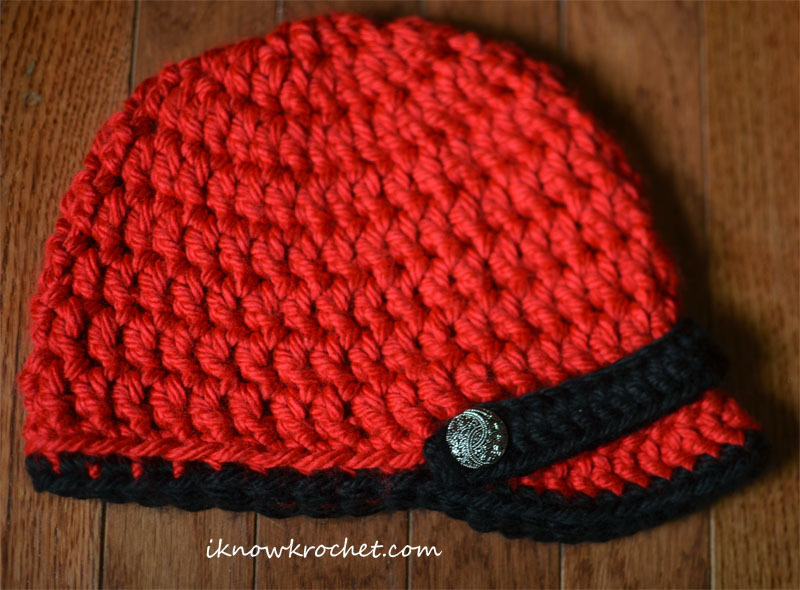 The main part of the hat is essentially a bulky beanie, but the visor makes the pattern worth buying. I have seen many newsboy patterns with "flat" brims that drop over the forehead, but this is a real visor that bends up and keeps its shape. The only tips I have are minor. 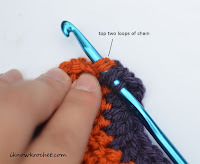 First, when switching from the smaller to larger hook, I would suggest still using the smaller hook to get through the loops of the stitch, then switching back to the larger hook to maintain the gauge. Otherwise, it's quite challenging to fit the larger hook through the smaller stitches of a previous row. I attached the buttons using the same yarn that I used for the hat. The buttons I selected are great for this because the shank opening is large enough to accommodate the super bulky yarn. 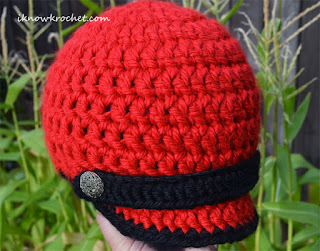 I did not sew the strap onto the hat, but simply fastened it with the buttons. This way, the size can be modified by adjusting the strap, if desired. I think the pattern with strap and buttons has a slightly more feminine look. This version is also absolutely adorable on both boys and girls. Omitting the strap and buttons gives it a simpler look that some men may prefer. I made two hats, one with the buttons and strap, and one without. I think the latter could work well for a boy or girl. There are so many possibilities for color combinations and patterns. 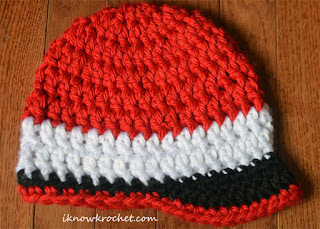 I kept it very simple for the red and black hat, and got a little more creative with the red, black, and white hat. I also somehow left out a couple of stitches from several rows on the hat with the white band, so it ended up being smaller than I originally intended. Luckily, there is a 10-yr-old boy in the Utes fan family who it should fit. 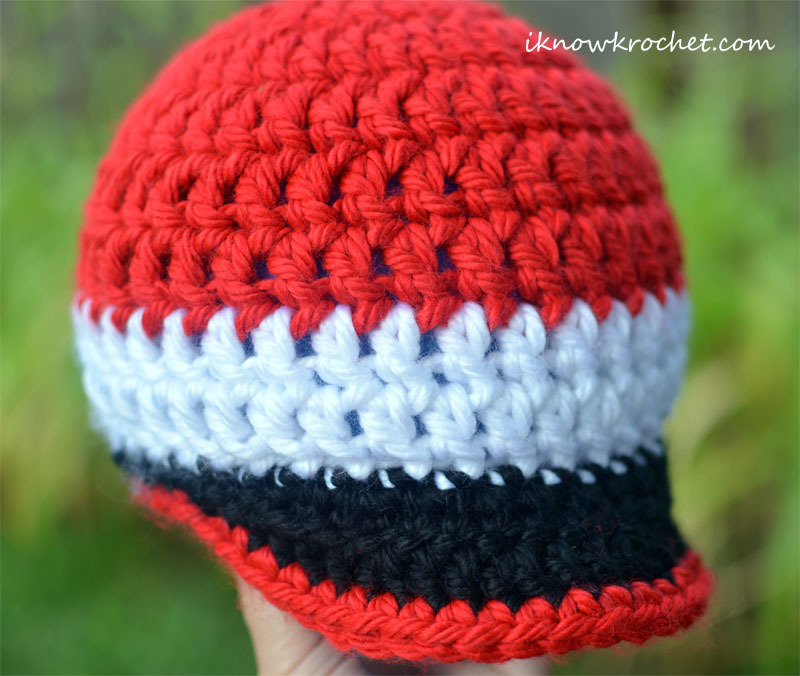 Dimensions: width: 9.5" height: 7"
Dimensions: width: 10" height: 7"
I am planning to make a few more of these hats in different colors for the football fans in my family. I just love how fast and easy this hat is to make, and using one's favorite team colors makes a special, personalized gift. What team colors will you be crocheting into hats this season? I finally finished the first crochet project I ever started! Yes, that means it took me 15 months to crochet a toddler-sized blanket. Of course, the reason it took so long is that I was distracted by multiple other projects, some of which I've shared in this blog. The actual amount of time invested in this nap time blanket was not that much, but this project did a lot of hibernating during the past year. Without further ado, here it is. One skein was enough for approximately 2 and 3/8 color bands (each band is 4 rows high). In terms of what actually went into the blanket, I used about 4.5 skeins of terracotta and 4.75 skeins of purple. 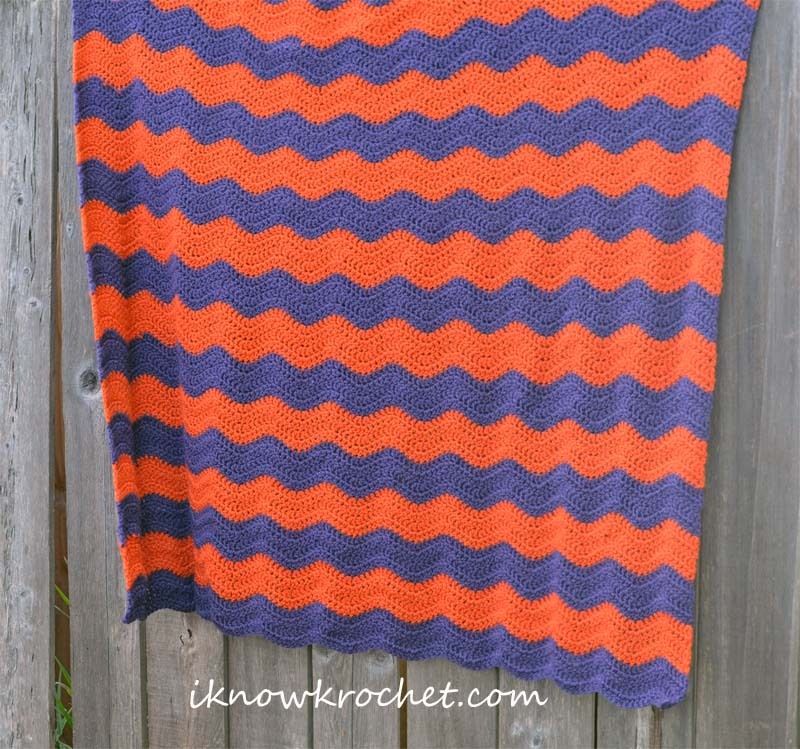 If you are OK with joining multiple pieces of yarn in the middle of a color band, then five skeins of each color should be sufficient for a blanket this size. However, I'm glad I purchased six skeins of each color because when I was about to begin a new color band but I only had a little bit of yarn remaining on a given skein, then I was able to just begin with a new skein. This is why I have half a skein and several small balls of each color leftover. I'm glad I ordered six skeins because it allowed me to minimize joining small lengths of yarn to finish most of the color bands. That being said, I still used some of the smaller pieces on several bands. I absolutely love this color combination. The terracotta is a very pretty reddish-orange and it complements the purple for a 1970s, yet modern feel. This yarn is also very soft. I found it by going into Michael's and actually feeling the various yarns. 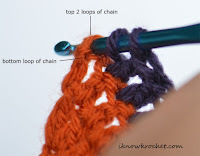 I highly recommend doing this, at least for beginners before you settle on a yarn you love. I then purchased the yarn online to save money, and also to guarantee it was free of the "craft store smell" (not necessarily a bad thing, but I prefer that my yarn has no smell at all). I purchased my yarn on Joann.com, but it is also available on Amazon (see affiliate link above) for a good price (at least at the moment as I am writing this post). Just be sure to check both sites before committing and remember to use a coupon if purchasing from Joann.com. Do you really need to roll the skeins into balls? When I first started out, I rolled my first couple of skeins into balls (as suggested in the tips I found online from some experienced crocheters). But this took me a long time with little advantage. I loved the ease of working from a center-pull ball, but it was hardly an issue to work from the outside strand of the skein in its original configuration. To avoid tangling, I did not pull from the inside, and I did end up rolling the last little bit into a ball when it started to get messy. This usually coincided with the end of the second color band for any given skein. The pattern is very straightforward and easy to follow. 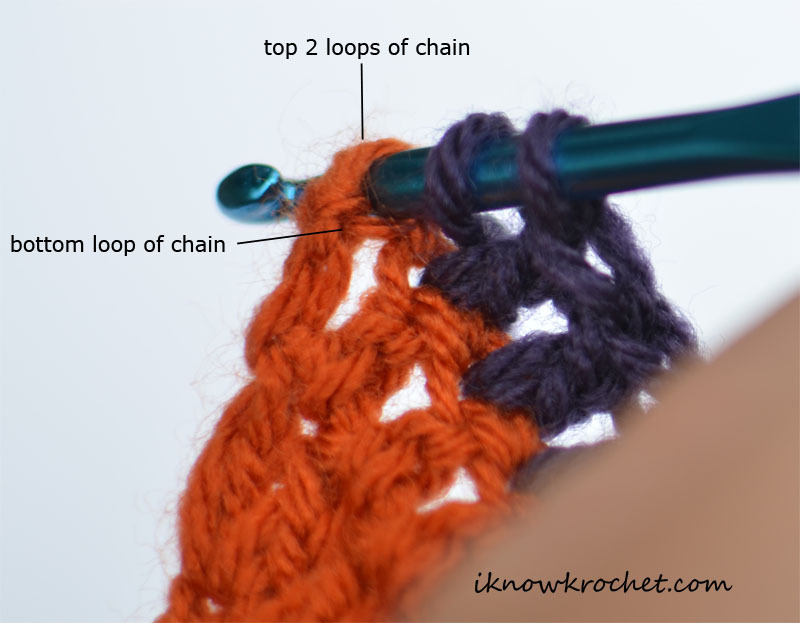 It is written for a smaller blanket, but it was easy to adjust the number of stitches in the starting chain to modify the pattern for a larger blanket. In the beginning, I lost count a few times and had to add a few stitches in places they didn't belong in order to achieve the correct stitch count (rather than "frogging" the project to the mistake, which was sometimes a couple of rows back before I noticed it). After I got about half-way done, the pattern was so ingrained in my head that I didn't make these types of mistakes anymore, although I was also more careful about double checking the pattern as I went along at that point. 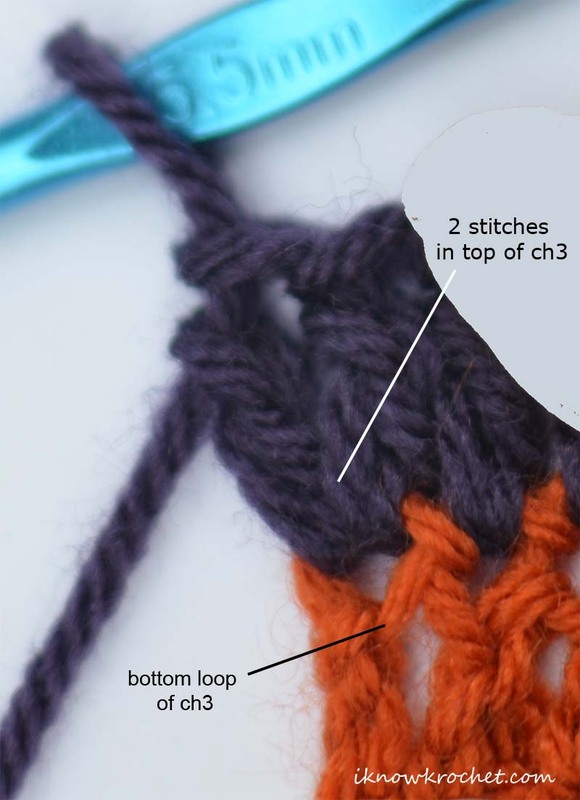 The pattern includes instructions to add a stitch marker several stitches before the end of each row. I am not entirely clear what purpose this serves. 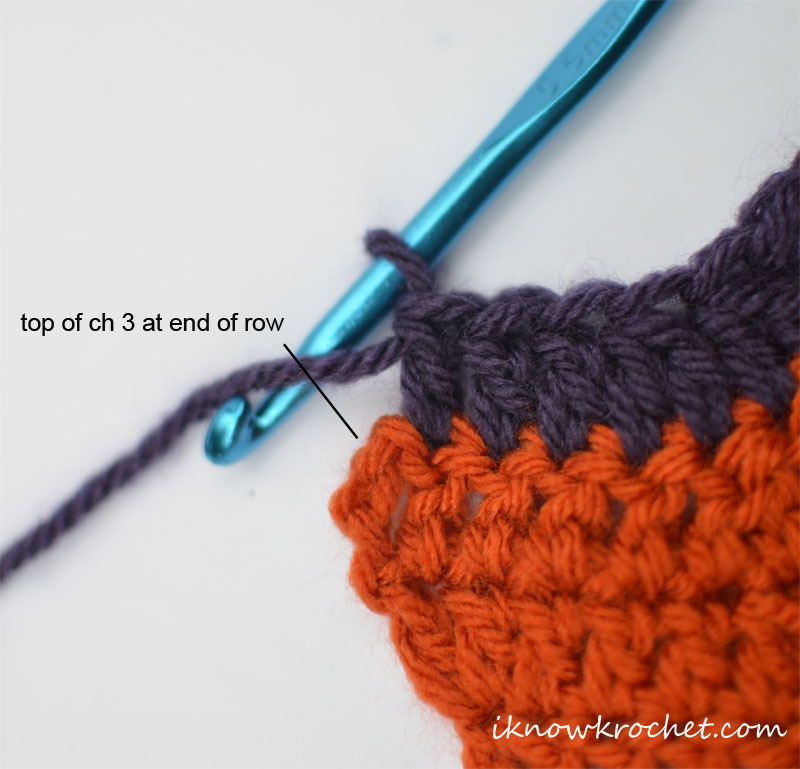 I think it is meant to make sure each row ends correctly, but if you keep track as you go, then there is no need for the stitch marker. 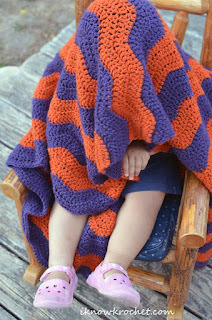 "Crochet in the top of ch3"
For some perspective on the finished size, here is my toddler modeling the blanket. It is plenty big for a preschooler's nap time. I did not add a border, partly to save time, but also because I prefer the simpler look. Also, if for some reason I wanted to make the blanket longer to "grow" with my child, then that option is still open since I'd just need to add more rows (and stockpile the yarn to ensure I have enough in the correct color). This is the largest project I've completed, to date. The pattern was easy, but actually finishing it was more challenging than I expected. How long did it take to complete your largest project? © I Know Krochet 2015 - 2018. Simple theme. Powered by Blogger.